"A small amp, which usually should not exist, because it makes possible, what can not be possible"
In the late 90's the Japanese Shin-ichi Kamijo created special circuitry for tube amplifiers to bring the rough sound of a Pentode power amplifier closer to the soft sound quality of a Triode stage. This was archived by adding a kind of "non-linear negative local" feedback by supplying a small amount of the modulated Anode voltage from the power Pentode before the putput transformer to the Anode of the preamplifier's Triode. 1st: The triode now "sees" the limited frequency response and distortions due to the modulated Anode voltage of the Pentode. The feedback circuitry adds these errors to the audio signal. Due to the 180° phase shift of the inverting power amplifier stage (negative feedback) these distortions will be eliminated and the frequency response is flattened. In a way, the Triode "supervises" the Pentode power amplifier stage. 2nd: Normally the feedback path is connected to the Triodes Grid but in this case it’s connected to the Anode so the Triode "sees" only the Pentode's distortions (and eliminates it) but not its own harmonic distortions. But why not using such a circuitry for a semiconductor power amplifier ? The result is absolute astonishing! The end result is the well-known Triode sound! You do not hear the semiconductor “sound” with its distortions; only the warm Triode tube sound is present and nothing more! There is no comparison to today’s tube / semiconductor hybrid power amplifier. Current Hybrid amplifier designs employ a semiconductor power stage that works autonomous without providing feedback control to the tube stage. The audio signal is feed through the preamplifier Triode tube stage without the benefits of feedback from the semiconductor power amplifier stage. Furthermore, there are distortions added by the semiconductor power amplifier stage. This results in a significant audible distortion on the speaker output compared to the STC architecture. 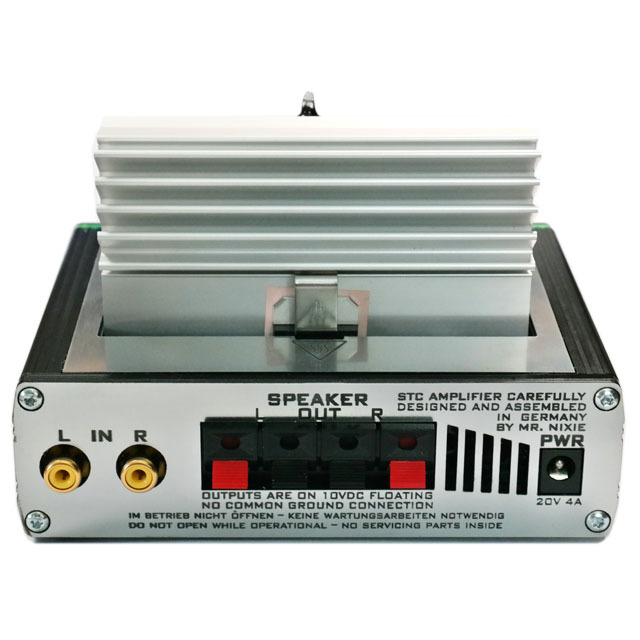 This kit comes fully inclusive with all parts including an external switching power supply, tubes and enclosures to build a plug-and-play amplifier as shown on the photo. Most parts on the board are SMT types with high-rade 1% resistors and are pre-assembled. You only need to mount and solder the through-hole components. This can be done in an evening. Please note that up to 170 V is present on the board (for the Magic Eyes Anode voltage) therefore this kit is not recommended for electronic beginners. The Consul is our input signal, here the direction is given. That the drummer, who dictates the rudder clock after announcement by the consul, will also have volume and speed fluctuations or a certain "freedom of choice," the overseer with the whip and the consul do not notice it, as the main thing is to progress as desired. But exactly this "inaccuracy" produces the pleasant and harmonic K2 harmonic distortion typical of a tube. But the overseers notice very well, if the rowers no longer come after and you have to "help" with the whip, so that they will faster work, that is the "STC-part" of the tube. The tube compares the feedback signal from the semiconductor power amp output to its own signal input, but "forgets" its own produced errors and their correction. This remains in a control signal, which represents only the deviations between semiconductor audio input and output stage minus its own produced error (K2 harmonic distortion). And as the semconductor power output stage is not as fast as a tube in the slew rate, the transistors will be hidden with the whip to speed them up. The output stage input signal is mixed with "whip strokes" in the form of needle pulses to approximate the slew rate of the output signal to that of the input signal. It is almost unbelievable to see this effect with a square wave input; and who presented it for the first time on an oscilloscope, rather believes in a measurement error. The output signal for the speaker really looks almost too "perfect"; and once you turn off the STC correction, you can see that the power amp is "slower" and the edges of the rectangle are flatter. Not only for this reason, such an STC power amp sound is incredibly dynamic and "fast". The rowers break down because they can not give more power anymore and all runs completely out of rhythm. 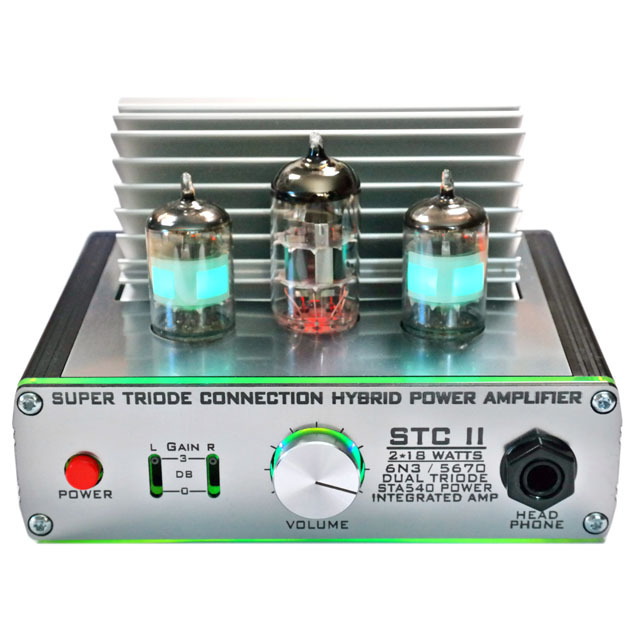 Transferred to the power amplifier stage this means, the tendency to oscillate and especially the non-harmonic distortion increases dramatically - and much worse - than in a normal semiconductor amplifier, if you drive the STC permanently into clipping. 1st: We need a power supply which is able to deliver the spikes, this is not achievable with conventional electrolytic capacitors due to their internal inductance; So Low ESR or even Polymer types have to be used. 2nd: Furthermore, the power amplifier must be able to handle such spikes and "penetrate" to the power transitors - and there it is already scarce in the usual low-end power amplifiers, because the drivers of the power stage transistors do not handle the high peak current for the power transistors - especially with several transistors in parallel, to reload extremely fast. In addition, we must take care not to drive the amplifier too long in the above-mentioned clipping to eliminate audible disadvantages. 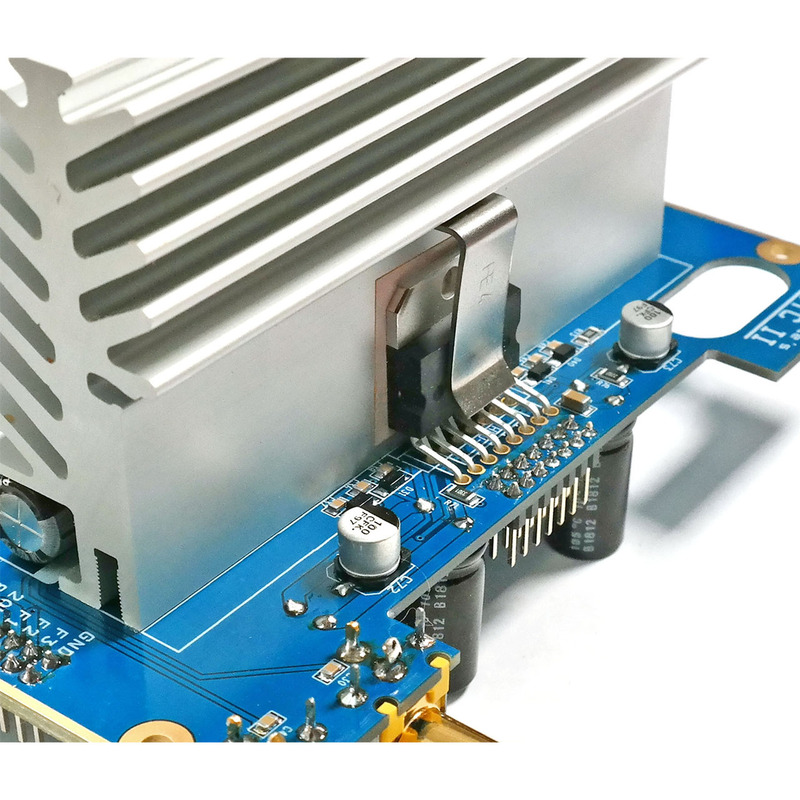 For this purpose, it is necessary not to limit the semiconductor power amp input, because then the whole thing will be much worse, but the audio input of the upstream triode. But once you have the whole thing under control, you get as a result a power amplifier that really sounds like a tube without the "touch" of silicon and - thanks to the low-resistance semiconductors - has also enough power without high operating voltages and without output transformer. At the same time, the costs in operation are also reduced by the very short lifetime of the exhausted power tubes in a tube designed amplifier. The triode in the input stage, however, is operated far below their maximum values and this results in an "eternal life". You can also see how "loud" the max. 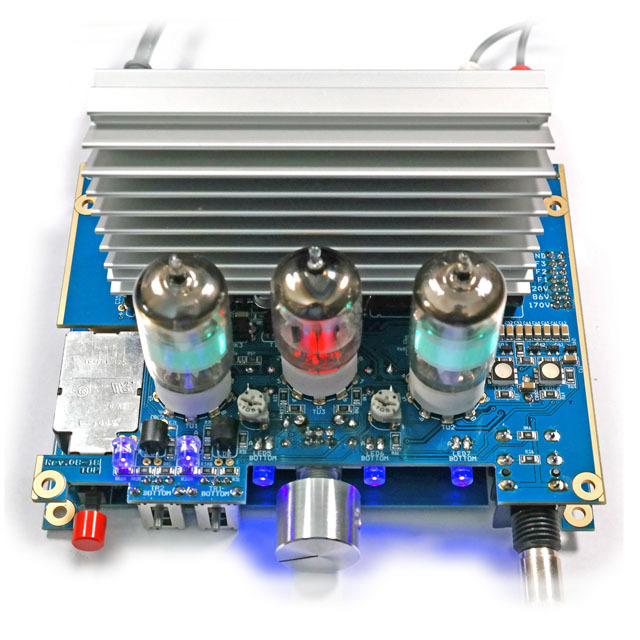 18 watts from the small STC amplifier can be. You cannot believe that the amp has only “so less” output power. Of course, the ear also wants to be satisfied, and if the STC is incredibly dynamic even at lower volumes, you do not need the extremely high volumes, because it just "feels" louder. For sure we can say that the STC principle does not work miracles. A worse sounding power amplifier will never run to its full potential with "STC correction", at the very most to a RF oscillator. The power amp needs to sound clean without STC and run absolutely stable - even at high frequencies. Then the STC principle sets the really tasty icing on. And this is the input signal of the power amplifier stage, direct taken from its input pin. 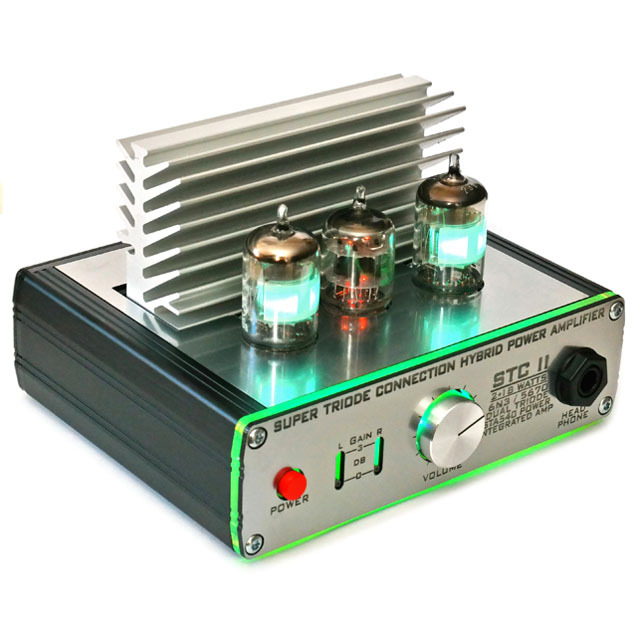 By replacing the supplied 5670 with the 6386 LPG Dualtriode you’ll get the ultimative tube sound of a SE amplifier with external added speaker impedance correction. An Eurpoean supplier for example is BTB-Elektronik in Fürth, or order direct here the upgrade. Feedback from Christian M. about this upgrade: "First of all, the most important thing: Both STCs, which I use as amplifiers for midrange and treble of my partially active driven Avantgarde horn speakers, run perfectly after the modification. First sound impression: "Impressively powerful, colored, „fat“....like an American V12 engine. More details in the background. But the tubes haven't any burn-in hours until right now. I'm just leave them playing in the background with music during barbecues on the terrace and later over night with noise. Although these tubes are not cheap, it has already paid off for me! Imitation expressly recommended." Fully inclusive kit with all electronical and mechanical components, 5670 / 6386 Dualtriode, 2 pcs. NOS EAM86 TELEFUNKEN Magic Eye tubes and desktop power supply with selectable mains cord.